Hatters boss Nathan Jones has demanded that goalkeeper James Shea learned from his 'naive' error against Shrewsbury this afternoon. With just over an hour gone and the scores level at 1-1, Shea opted to throw the ball down inside his area for a free kick believing that Lee Angol had been flagged offside. However, with neither referee Carl Boyeson, or the assistant flagging, Angol just simply rounded the baffled stopper and tapped home to make it 2-1. Speaking afterwards, Jones said: "The referee didn’t blow the whistle, no flag went up, keep the ball in your hand, end of. “Don’t put it down and allow Lee Angol five seconds, because at the end of the day it was all confusion. “Even then he should have booted the ball out and then think whatever happens, I’ll kick the ball away. "But he didn’t and that shows naivety and an element that has been part and parcel of our defending this season so far. “That’s the thing we have to eradicate as we can’t be scoring three to win a game at home. When asked afterwards if Shea would be buying his team-mates a drink after goals from Jack Stacey and Elliot Lee ensured Town made it back to back home wins, Jones said: "Never mind the lads, I’m the one who has the sleepless nights. "So never mind beers for the lads, if he wants to buy any beers, he can come into our office." 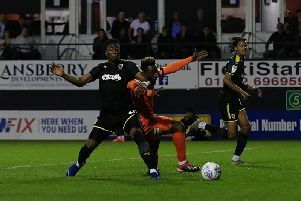 Shea did redeem himself with an excellent late save from Angol to deny the former Hatter giving Shrews a point, but Jones added: "He did his job, so for one point in the game he didn’t do his job and apart from that he was excellent, he was absolutely excellent. "But what we don't want to do is say, 'oh he was excellent,' give him a pat on the back and we’ve just lost 2-1 to Shrewsbury in a game we should never have lost. "So those are the things we need to eradicate. "When he hears the whistle, if he has any confusion then keep it in your hands and he won't make that mistake again, I promise you. "But we're having a stiff learning curve and we're having to do that.